Series F » Unitrack Industries, Inc. Taking up just one “U” height (1 3/4″), this compact, sturdy enclosure of clear iridited aluminum, holding a row of up to three fans, two rows of three fans or three rows of three fans, can be rack mounted into standard 19″ and 24″ cabinetry. 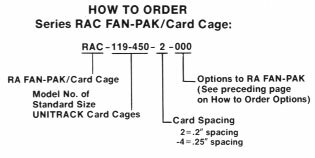 The Series F Fan-Pak is usually mounted below a card cage, so cooling air can be moved up and around p.c. cards. Thus, cooling air can be directed to the exact “hot” area where it is needed as a supplement to a cabinet blower, which in many applications cannot adequately cool the entire cabinet area. 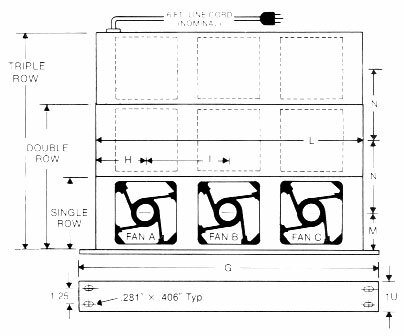 All Series F Fan-Paks are supplied with long life 100 CFM fans, which are securely mounted to the enclosure. Integral finger guards cover openings on each side. The standard Series F Fan-Pak comes equipped with replaceable Fuse and a six foot Line Cord. Terminal Block connection in lieu of the Line Cord, is available upon request. UNITRACK also offers several options: Pilot Light, Power Switch, Fan Alarm® Circuit and Filter as well as silk screening for panel nomenclature. 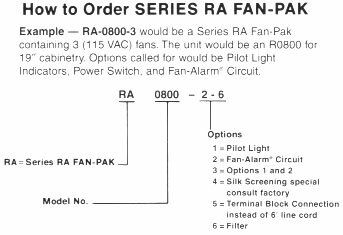 Series F Fan-Pak are clear iridited unless otherwise specified. Replaceable fuse 115V AC fans, and 6′ line cord are standard. Other fans are available for 12, 24, 48 VDC or 220 VAC. These fans rated 100cfm are quiet, long lasting and efficient air moving devices. Unitrack has tested these for their performance and offers them guaranteed against defects for a period of 90 days. Fans are stocked in quantity. Consult factory for fans of other power requirements.